I made this sauce to go with my Baked Chicken Bites. You don’t get a more classic dipping sauce than Honey Mustard. But I made it special. 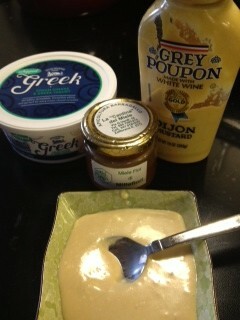 I used Dijon which I prefer for a honey mustard sauce and mille fleur honey that I bought while in Sicily. I also mixed it with my new favorite Greek Cream Cheese. 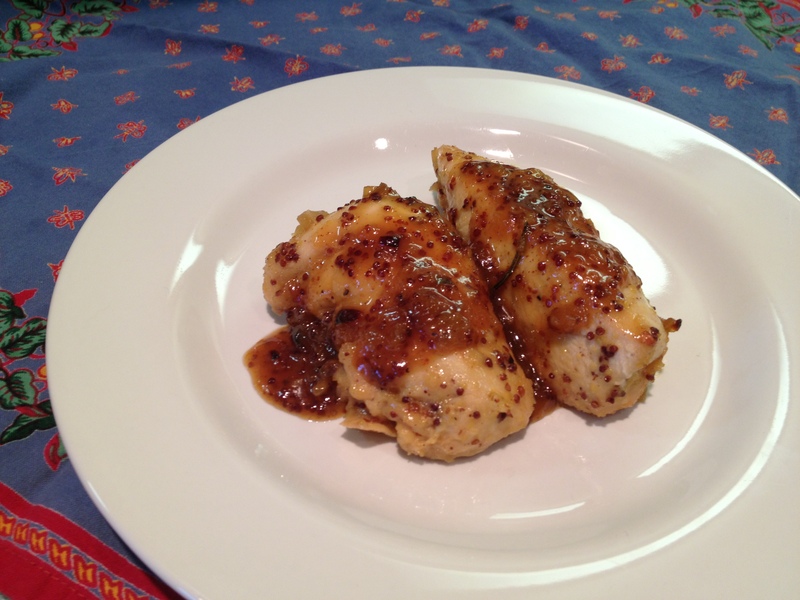 This is a delicious, silky, sweet, tangy sauce that would be perfect for french fries, pretzels etc… you name it! Give it a try! mix it all together. Taste and add a bit more of any ingredient if you’d like. I really don’t have all that much to write about today. I found the original recipe for this on Pinterest and improved upon it a great deal. It came out great, the chicken was nice and juicy, the honey mustard reduction at the end made a delicious sauce-it was sweet and mustardy with just a hint of the rosemary and white wine. The shallot added a nice level of flavor as well. It’s also a one-pan dish which is a plus in my book. The prep for this is pretty non-existent aside of dicing a shallot so it’s very quick to put together. When the chicken is initially finished cooking the sauce is pretty liquid so I thought reducing it would be a great idea! It wouldn’t be good to just leave all of that yummy flavor in the pan. I was right. The reduction is so so so tasty. I’ll certainly be making this again. I imagine the chicken would be amazing sliced up on a sandwich or over rice if there are left overs. 1 & 1/2 lbs boneless skinless chicken breasts cut into even pieces (my package contained 2 pieces so I ended up with 5 smaller portions). In a dutch oven (or other stove and oven safe vessel with a lid) large enough to hold the chicken in one even layer add 2 tsp of the olive oil and heat over medium heat. When hot add the shallot and sautee until translucent-about 5-7 minutes. Then add the garlic and sautee for another minute or so. If you need more oil add extra little by little but you want to get some bits on the bottom of the pan so don’t add too much. Deglaze the pan with the wine and scrape up the bits. Let the wine reduce a bit. Be careful-the steam is hot. Place the chicken pieces into the pan on top of the onion and garlic. In a small separate bowl mix together the mustards, honey and additional 2 tsp olive oil. Pour the mixture over the chicken and move the chicken around to be sure all are coated. Place the rosemary sprigs into the sauce. Put the lid on the pan and bake for 20 minutes then remove the lid, baste the chicken with the liquid and return the chicken to the oven and cook another 25-30 minutes until it reaches a safe consumption temperature and has browned slightly around the edges. Place chicken pieces on a plate, tent with foil and set aside. Over medium heat cook the sauce remaining in the pan until it has reduced to half and is thick. Add the butter and mix it through. To serve spoon the reduced sauce over the chicken pieces. Greatly adapted from this recipe at goodlifeeats.com.